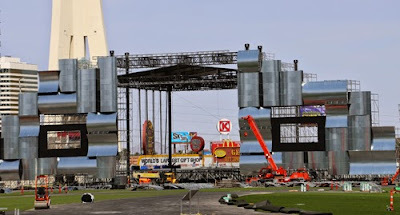 +Rock in Rio USA is around the corner. Organizers of the mega event, which will span two weekends in May 8 and 9, 15 and 16, are in a rush speed mode for the construction of the City of Rock, the zip line and everything else. I took these pictures today to show where the project is by now. The event in less than a month away. Rock in Rio's inaugural event, in January 1985, broke records with 1.38 million attendees and last year's event in Rio sold out all 500,000 tickets in just four hours. Rock in Rio USA organizers are struggling to sell at least 50,000 tickets for each day of the event, a modest proposal, comparing to 90,000 thought before. Even taking in consideration that in Vegas, the organizers have to build the event literally from scratch - from the City of Rock building to the zip line - the prices are a little bitter, not to say outrageous. In such hard economic times, in my humble opinion, the ticket prices are out of reach for most students, who are the majority of people attending the event. Since I found out +Rock in Rio was coming to Vegas, I've been asking concertgoers if they would attend the event. Most of their answers were "I wish, but I can't afford it", while others stated "even if I had the money I would not pay this much to attend this event". Single day admission price for general Admission is $169 but it has been set at a mandatory two-day spend; VIP admission sells for $498.00. If you are attending 4 days of the event, just do the math! More bad news, if you already got your tickets during the pre-sale event, which were originally around $280, you cannot exchange them now for a single admission ($169). Single day admission for the Rock in Rio in Rio de Janeiro is around $100. There are also specials such as cut in half for students, seniors, and so on. Many Brazilian natives as well as Las Vegas locals are asking why the tickets are so expensive here? So, in justifying the cost of the tickets it may be due to the initial construction of the City of Rock, advertising/marketing/promotional fees, the cost of the selected entertainers could perhaps be very high. Las Vegas is home of many big name artists featured on MTV, movie soundtracks, as opening acts for large bands such as Three Days Grace, Grammy contenders and award recipients. Just as the host of a successful party must be present, local Las Vegas artists would be honored to perform on these stages. In adding the event to Las Vegas the promoters must learn to accommodate American culture and understand the economic standing of its citizens. 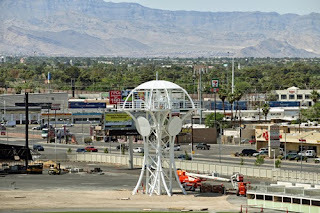 The City of Las Vegas is host to a multitude of large events and local celebrities, artists, comedians and entertainers of all types are a part of the events. This is not the case for the first Rock in Rio USA, who's hodge podge of guests would be prudent for the attendance and budget of the event to invite local artists along with major headliners. Las Vegas taking the lead? Rock in Rio is one of the largest events in Rio de Janeiro, second only to Reveillon (New Year's Eve - attendance of 2.5 million people). Its guests have included such legendary acts as Queen, the Rolling Stones, Ozzy Osborn, Foo Fighters, Guns N' Roses and Prince just to name a few. 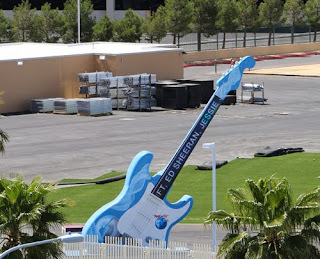 It was thought that Las Vegas's Rock in Rio would take the lead in size and glamour, comparable to other Las Vegas events. Now, the question is "If you build it, they will come"? 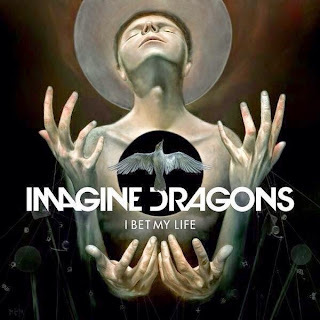 Etiquette rules when you are having a party in other people house, you must invite people who live in this very house, such as +Imagine Dragons.